Fall at Clay and Limestone it all about the simplest of wildflowers. Wildflowers with no known pedigree! Plants like New England Asters (and other native asters), Goldenrods, False Dragonhead and others. These hardworking beauties bloom in my zone 7 garden until frost. 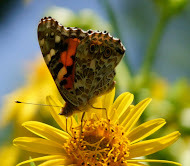 Colorful and beautiful flowers that are important plants for nectaring bees and butterflies. I like to plant New England aster with goldenrod. A dynamic duo. A perfect marriage of good looks and functionality. They provide color and nectar at a time of year when both can be in short supply. New England aster is a host plant for the Pearl Crescent caterpillar. A wide variety of butterflies and bees visit the aster as a late season nectar plant. Aromatic aster/Aster oblongifolius is just beginning to open! are often seen as a little too pushy for most gardens. Their reputation is warranted! They spread quickly and need to be kept in check. But, I find their waving wands of golden color covered with dozens of bees a beautiful sight! 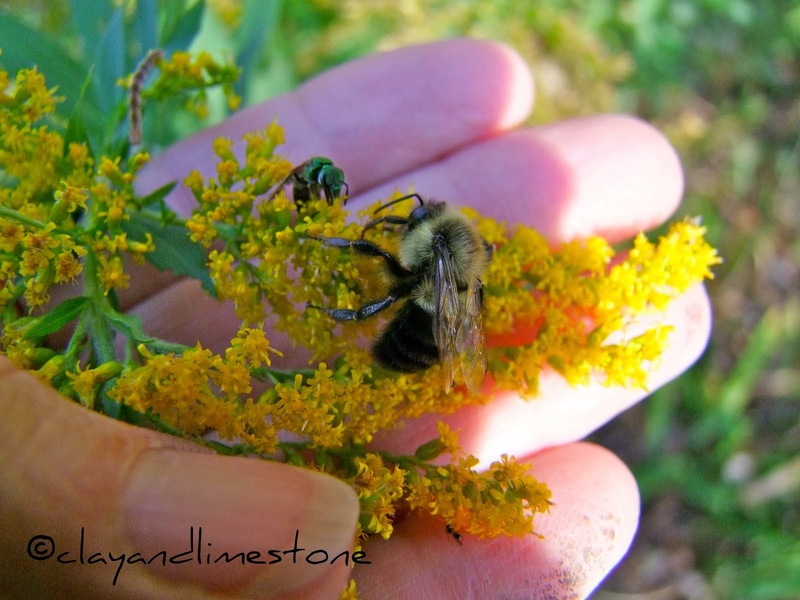 Critters are very attracted to goldenrods. Small bees, wasps, flies, and beetles visit its flowers for nectar and/or pollen. According to Illinois Wildflowers site "the flowers are especially attractive to many species of wasps and flies, which play an important role in controlling insect pests, or breaking down organic matter in the detritus cycle." It's a beast of a plant, but it's welcome here. I don't think I could garden without these rough and tumble beauties! I planted False Dragonhead, but the Goldenrod, Mistflowers, Snakeroots and almost all the native asters were here long before a house was built on this property. I've allowed them to seed themselves about the gardens and only remove them if they get too enthusiastic. The white snakeroot is one of those enthusiastic, but useful plants. It attracts bees of all sizes~~small, large and in between! It grows robustly in shade! but, helpful in the garden. Many find them both messy and weedy. I adore them for their stature and color. Verbesinas provide food for monarch butterflies, carpenter bees and honey bees. catbirds, woodpeckers, waxwings, bluebirds, and morning doves. That's a lot of happy birds! The United States Declaration of Independence was written in fermented pokeberry juice. and perfect for this garden. My holy grail task~to capture a flying bee in focus that shall be a merry chase! The fact the Declaration of Independence was written in fermented pokeberry juice almost-almost I say-raises it up in my view a wee bit. Too neat! Your asters and goldenrod look very good together. So nice to have such good wildflowers. YES !! The flying bee picture .. PERFECT !! Husband mentioned that the bees we see now are so BIG they can hardly fly .. I think we are in for a very cold winter .. ugh !!! Hi Gail! I've been on a one-Ben campaign to encourage people to love pokeberries forever---to me, they're ornamental from the time they appear in spring until their gorgeous red leaves and sprays of purple berries delight the landscape in fall---but please don't try to write with them! NOW I know, thanks to you, why the original copy of the Declaration in the National Archives is almost illegible when the Constitution is still as easy to read as on the day it was written. The Declaration is fading to white, a national disgrace, but I suppose under the circumstances it really can't be helped! Thanks for sharing such a fascinating fact along with your wonderful photos. Love your wildflowers! You're right about the perfect pairing of solidago and aster! Your posting reminds me that it's time to visit the NC Botanical Gardens nearby to see the fall wildflowers. PS There's a hummingbird on a feeder right now. Seeing fewer, but our pudgy little girl is still here. Gail I have to wonder why the Physostegia virginiana has not found its way to the mountaintop. An oversight of the resident gardeners, I am sure. The situation must be remedied I think. The last bee shot is way cool, like you have a bee cam on a bee flying behind. I just collected some Snake-root seed. I'm hoping to establish some deeper in the 'woods' than my other shade garden plants like. A late bloomer in shade is too good to pass up. I don't have any livestock to worry about eating them and there's little chance they'll escape from my little hole in the swampy woods to any pastures nearby. What a wildflower meadow you have! I too love the bright yellow of the Solidago- it is a nice long blooming plant long into the season. 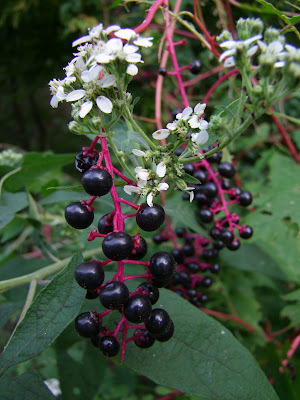 Pokeweed juice, fermented?? Very interesting fact. I think your bee in flight is just amazing. Great shot of the bee in flight! The golden rod is very welcome here but its pretty much done for now. There are a couple plants blooming but not much. I really would like to get rid of the pokeweed. The mockingbirds plant it everywhere and it comes up in every bed. ah, white snakeroot, I saw a huge patch of this the other day and remarked to myself how attractive the puffy white flowers looked in a mass grouping. Now I know what it is! I am a goldenrod fan, good to know that it attracts beneficial insects, I'm just starting to realize that not all wasps are bad. OFB, I imagine that restoring pokeberry juice might be impossible! Your photos are just BEE-utiful, Gail! This is a perfect example of why botanists or environmentalists say to plant native--your garden illustrates the results perfectly. I think you may have found the Holy Grail; if not the bee in flight, then the photo of one on the salvia yesterday has to be a prize-winner. I've been recuperating from a cold and have had my nose stuck in Dan Brown's newest book the last few days so I missed yesterday's post. By the way, although he wrote a lot about the mysteries of the Founding Fathers, he didn't mention the pokeberry juice:) Glad to see the sun has come out for you--definitely a cause for celebration! The aster/goldenrod combination is prefect. I need to collect some seed this fall and start planting them together. Hoorah for the perfect pair of fall fellows. Busy bees partaking of the fall bounty of your garden. I think you got it! The flying bee that is. Showing you some tail. I would love to add one of your bee photos to the bee series I am painting. Fantastic fall fun. I agree with you, New England Asters and Goldenrods seem made for each other, with complementary flower forms and a color echo with the yellow. To get the bee photo, have you tried panning with the camera? The other thought I had was that something doesn't have to be exotic to be beautiful! I love all the old wildflowers and natives and I especially love the old fashioned names for them...it just reminds me of a simpler time. All of your fall blooms are beautiful and that last shot of the bee--awesome! I like plants that take care of themselves too, and asters are not only beautiful but tough as well. I love yellow and purple together. I have some wild Rugose Goldenrod that I should put into some different places in the garden. One has volunteered to be in the vegetable garden already. We have tons of wild Goldenrod (several species) growing everywhere that for the most part are just too tall and aggressive to grow in civilized quarters. Now I know what to do with all of those pokeberries. They are beautiful when ripe. Does the ink the Constitution was written in actually have a purplish cast, or did they darken it with something else? Beautiful pictures of the asters and goldenrods and of the bee in flight. Have a good Monday! PS I guess fermentation darkened the ink? Our country side is dotted with these two babies, I love them but most think of them as a hayfever problem, especially the golden rod. Now the bee, I think you have gotten vvvery close to your holy grail. The asters are always a welcome sight at this time of year and your shots are lovely especially the bee in flight. Stunning photos, Gail, especially the opener ... the big fat bee on your New England Aster. Thanks to your tending hands, everything (including your 'rough and tumble' wildflowers) seems to thrive in your clay and limestone. Your site is so lovely, I wounldn't want to leave either! Your wildflowers really are pretty, the goldenrod with the asters is a great combination! I wish I had the space for it. I love the bee shot! I just found out this summer, through the wonders of blogging, about the pokeweed ink and the Declaration of Independence. I am with Tina now on raising this plant up a notch, although a small notch. We used it for Indian war paint when we played as kids. The shots of your rough and tumbles are very nice. I love the way even the take-care-of-themselves plants aren't neglected in your garden - you give everyone their moment in the spotlight! Some of these are in bloom up here too - hopefully for a couple more weeks. Your flowers look lovely and no sign of the dreaded mildew which would have attacked many of them in my garden. Such wonderful photos, Gail, including of the flying bee. It's hard to bee-lieve that we're into autumn already, isn't it? It was just spring last week, or so it seemed. This IS a lovely time of year even when I grump about it. A lovely post....great photos and wonderful wildflowers! Perfect combinations indeed! Love that trivia bit and I agree with Frances... you have succeeded. They "helps themselves" all over our pastures here...and do it so beautifully. We have a lot of the deep purple shade of Aster, as well as the lighter shade, and yes, it's perfect with the Goldenrod. I love that last photo, Gail! In my opinion, you've already captured your bee in motion! Great shot! All of them are. Anything that brings the bees and butterflies--birds too--is a good plant for me! I have a lot of wildflower photos that I need to post. I took tons of them in Maine, and the bugs I captured were amazing. Dragonflies, butterflies, bees, you name it. It will be a post 'I'll get to'...I keep telling myself! How do you manage to post so often, and in such detail? I can always count on a nice surprise when I stop over to visit here. Something fun, and uplifting. Thanks for that! Fermented pokeberry juice? Why fermented? Were they also drinking it I wonder? Thank you for that little fact that will now nag me with more questions, ha! I love asters and goldenrod together. Nothing says fall like they do. We drove to Little Rock this past weekend and I noticed all the goldenrod starting to bloom along the highways. I LOVE that last shot of the bee. You got him! Everyone is loving that tidbit of history you gave us Gail. I like it too and had no idea. I also love that moss/lichen covered birdfeeder. It's picture perfect as is that first photo! WOW. Your bees are a happy lot, that's for sure. I have a far way to go to make mine just as happy. Hi Gail! I thought I'd left a comment here... guess not. Anyway, this was a great post (as usual!). Do you know, if you were here right now, we'd go right out and make a concrete Garden Ball! ;-) Or, at least in the morning. ha. Can you believe that I'm having trouble believing it's basically October already?? Back again to wish you Heartfelt Congratulations on being the recipient of so many awards at Blotanical!!! I'd forgotten all about it and hadn't been over there for awhile... so I was able to sneak in for a few votes last night before it closed. ;-) Have a 'Specially Great Day! I'm brave, I'm going to try some goldenrod. It's so pretty. I bet it's good in bouquets too. Fall is such a wonderful time of the year for us in the SE US - all the comps in flower --goldenrods, asters, verbesina, etc. Such a nice post, thanks! very useful article. I would love to follow you on twitter. By the way, did you guys hear that some chinese hacker had hacked twitter yesterday again.